“Do Aye! !” Translated variously as “our cause”, “it is our task”, or “our struggle” is a familiar cry for anyone who has been to a protest on behalf of Burma. 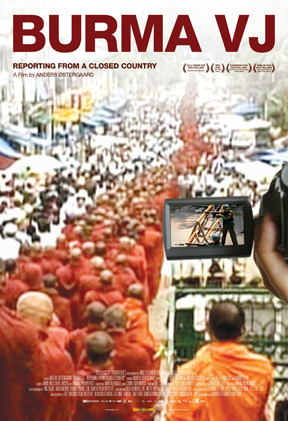 I’ve been attending protests like these for about nine years, but the sound of “do aye” (pronounced daw-YAY) has never sent a chill up my spine quite like it did when I heard it being chanted by the monks in this film. 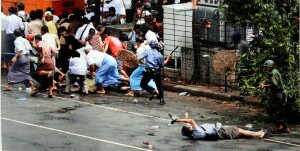 In late August 2007 an uprising began which culminated in massive peaceful demonstrations in the streets of Burma, led by monks, in late September. These protests against the brutal military dictatorship which has existed there since 1962 made world headlines, as did the brutal crackdown which followed. Almost all of the footage that is seen in this documentary was filmed using rudimentary consumer-grade hand-held camcorders and had to be smuggled out of the country. This documentary skillfully and deftly edits the footage and brings it together in a cohesive whole to tell a story that will blow you away. The story of Burma is a moving one, to say the least, but that is not what this film is about. There are plenty of books and online resources where one can educate oneself about the history of this nation, and her nobel prize-winning leader Aung San Suu Kyi. This is about the here and the now. Even though these events took place almost two years ago, the sense of urgency and immediacy of the events can almost be felt. The sights, always close up and shaky, the sounds always hinting of slight claustrophobia due to the cameras always having to be hidden under jackets and in bags. We follow the plight of a young reporter known only to the viewer as “Joshua” and the narrative is seen through his eyes. Credit must be given to Anders Østergaard, the Danish director who put the footage together to tell his story. The build ups are stirring, and I was struck particularly by one which followed a public announcement that people were no longer allowed to congregate in groups larger than five. A pair of people is seen on a street corner, they are then joined by another, then, after some time, another, all the while the cameraman counts. Eventually then number five is reached, whereupon the small band is overwhelmed by a marching column of hundreds of monks chanting “do aye”. 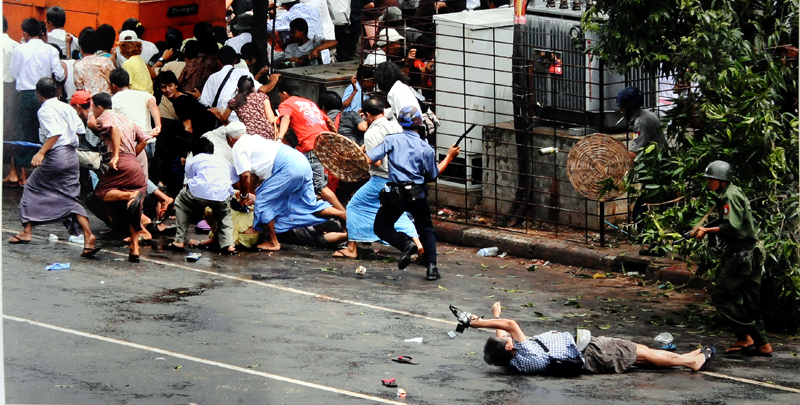 The brutality of the crackdown is well-documented, and you really feel the air of suspicion that overshadows everything in the day-to-day business of everyday life experienced by everyone. As the protests build up, only to be knocked back down, you really get a sense of how significant every individual act of defiance really is in such an environment, an environment so completely foreign to our own. In light of the recent post-election turmoil in Iran, as well as the show-trial of Aung San Suu Kyi herself, this film brings it home to the viewer, in a very real way that all is not right in the world today. Admirably, the film does not attempt to gloss over, or hide the violence or brutality that takes place. Some of the scenes are very disturbing, but not inappropriately so – you should be disturbed, the truth IS DISTURBING. Strangely, the most chilling things aren’t the scenes where innocent, peaceful monks are beaten to a pulp, nor even the one where you see the Japanese journalist shot at point blank range. The most chilling moments are after the streets have been cleared, when everything is quiet, when “order” has been restored. The silence is enough to make you cry. The film ends, as did the protests, on a sombre note. We learn in the closing credits that the headquarters of the DVB were raided and most of the reporters were detained and await trial, expecting to receive life sentences, for the simple crime of wanting to tell the truth. This film serves as a reminder to us all never to take our freedom for granted, and that there is a great deal of work to be done in order to make our world a better place to live. I was moved. Greatly. Four and a half stars.